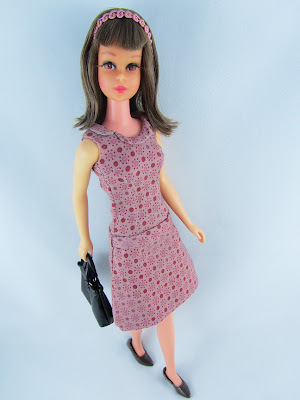 A photo request from Ms. Leo, here's Francie wearing her mod dress that Poppy Parker modelled on Suit Up Saturday #3. Surviving the test of time all the way from 1966, Francie may be yellowing from old age but she remains an all-time favorite in my collection. You know I like the dress before on Poppy but I really love it on Francie! She wears it well! I agree, Ms. Leo. Francie is definitely still rockin despite her age! Thank you Aniarozella and MJ!